A year on from the Fight of the Century that wasn't even the fight of the night, boxing could do with a classic for the ages in Las Vegas on Saturday. Floyd Mayweather versus Manny Pacquiao was a terrible let-down followed by a crashing hangover, but Saul 'Canelo' Alvarez versus Amir Khan might be the fight that elevates one or both of them into the superstars the sport of boxing needs. After a slow start, Alvarez-Khan has gained traction on the Vegas Strip as the week has worn on. Friday's weigh-in outside the spanking new T-Mobile Arena was attended by a few thousand Mexicans, already in full swing ahead of Cinco de Mayo weekend, and a small but vocal contingent of Brits. Oscar de la Hoya has thrown the kitchen sink at the promotion, because he knows what's at stake. While Mayweather-Pacquiao had a record 4.6 million pay-per-view buys in the United States, both fighters' next bouts (against Andre Berto and Timothy Bradley respectively) pulled in about 400,000 buys each. All those floating fans Mayweather-Pacquiao attracted quickly floated off again, before the two men themselves, the sport's only active household names, hauled their riches into retirement. Whether Khan, who is bidding to become Britain's 12th current world champion, has enough ring smarts to take Alvarez to the limit is questionable. Khan, 29, is bidding to become only the third former light-welterweight world champion to win a middleweight world title, after De la Hoya and Miguel Cotto. That tells you all you need to know about how difficult it is to do. Even Khan doesn't sound too convinced about his chances. The Bolton boxer has claimed he doesn't have the power to hurt Alvarez and admitted he'll need to be the best he's ever been to have a hope. And that's assuming the champion hasn't improved since winning the WBC belt from Cotto last November. Alvarez has had 48 professional fights but is only 25. That makes for a frightening combination of vast experience and learning potential. Remarkably, Alvarez turned pro three months after his 15th birthday. Apparently, social services turn a blind eye to boys fighting grown men over in Guadalajara. He'd had 21 fights by the time he was 18 and was only 20 when he outpointed Britain's Matthew Hatton to win the vacant WBC light-middleweight title. 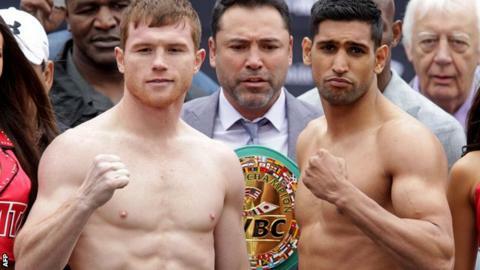 Will Amir Khan's speed or Saul 'Canelo' Alvarez power win the day? Hatton, the younger brother of British boxing legend Ricky, believes Khan can cause Alvarez problems but will come unstuck in the end. "When I saw Canelo at the weigh-in, I looked him up and down and thought: 'I fancy this'," Hatton told BBC Sport. "But on fight night he whipped off his dressing gown and I couldn't believe the size of him, it was like Popeye had been at the spinach. "One thing Amir certainly doesn't lack is self-belief. But jumping up one weight division is difficult enough, jumping up two is a massive ask. "Amir is a lot better with Virgil Hunter as his trainer and is boxing to a game-plan. And he has the speed to cause Canelo trouble. But I just can't see Amir overcoming the size and strength factor and holding him off for 12 rounds." While the match was made at a catch-weight of 155lb, five pounds under the middleweight limit, Alvarez is expected to come in at about 175lb, almost a stone heavier than Khan. Alvarez has been knocking light-middleweights out for fun for the last 10 years, while Khan has been knocked out twice and wobbled on numerous occasions. Furthermore, Alvarez is much more than just a slugger. True, Mayweather made him look like a club fighter at times when they fought in 2013, but Alvarez has learned from that defeat, as all good boxers do. In his four fights since, he has beaten a future hall-of-famer in Cotto; a slickster in Erislandy Lara; and a couple of punchers in James Kirkland and Alfredo Angulo. As such, De la Hoya's repeated assertion that Saturday's fight is all about power versus speed appears to be a crude generalisation. "Canelo is a very smart fighter with good boxing skills," Khan told BBC Sport. "And timing beats speed, so that when I do throw good, fast shots I need to get out of the way as quick as possible. "But Canelo still makes mistakes and he made plenty against Cotto. If he makes the same mistakes against me, I believe I can take advantage. I've got the speed and the movement, he's never faced anyone as slick as me." There is speed of movement and there is speed of thought and the latter could be even more important than the former against Alvarez. For his part, Hunter, who was hired by Khan following his knockout defeat by Danny Garcia in 2012, believes his charge has matured into a much more cerebral boxer. "The first thing I had to address was his recklessness," said Hunter, who trains Khan at his gym in the San Francisco Bay Area of California and also handles Andre Ward, arguably the best pound-for-pound boxer on the planet. "It was hard to take away things he'd been successful with, but once I convinced him to look a little deeper, it was easy to implement the changes that needed to be made. He now understands boxing on a different level. "He can now fight a very disciplined fight when he has to. But I don't think he's scratched the surface of what he can do. Physically he's a marvel. When he can put the physical and mental together, he could become special." The stakes for both fighters are huge. If Alvarez wins and wins in style, he will be anointed the new face of boxing and a clamour for a match with Kazakh knockout artist Gennady Golovkin will reach fever pitch. If Khan wins, it will go down as one of the biggest upsets in boxing history - almost up there with Lloyd Honeyghan's victory over American sensation Don Curry in Las Vegas in 1986 - and cement his place among the British greats. If Khan is still standing heading down the stretch, we could be in for a treat. The sport could have two new superstars and we might get a rematch we can call a super-fight.